At FPX, we understand the importance of providing today’s B2B buyers with the services and solutions they want via an experience that keeps them coming back. 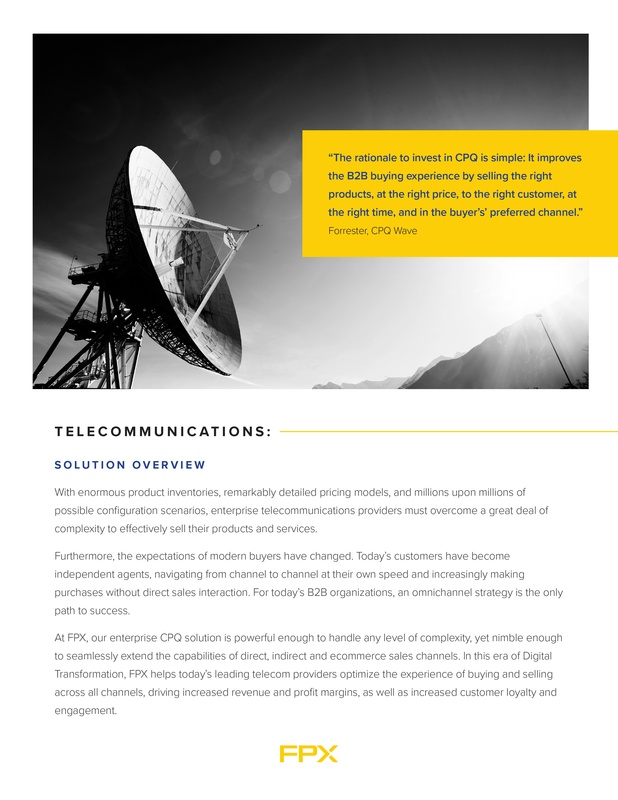 With our enterprise CPQ solution, global telecommunications companies are able to configure, price, quote and deliver their highly complex solutions to customers across all channels — direct sales, indirect and partner channels, and ecommerce. With FPX, telecommunications companies now have the power and agility to meet the demands of today’s fast-paced market. Backed by more than 30 years of CPQ experience and unmatched domain expertise, Learn more by downloading our Industry Vertical Solution for Utilities & Energy data sheet or contact us at fpx.com.